hey say poverty makes crime. They say if one improved education there would be less crime. They say if one cured the lot of the underprivileged one would have solved crime. All these “remedies” have proven blatantly false. In very poor countries there is little crime. In “improving” education, it was tailored to “social reform,” not teaching skills. And it is a total failure. The fact that rewarding the underprivileged has simply wrecked schools and neighborhoods and cost billions is missing. So who is “they”? The psychologist and psychiatrist, of course. These were their crackpot remedies for crime. And it’s wrecked a civilization. 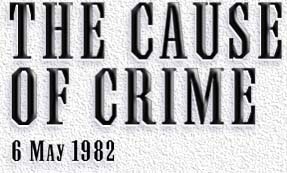 So what IS the cause of crime? The treatment, of course! Electric shocks, behavior modification, abuse of the soul. These are the causes of crime. There would be no criminals at all if the psychs had not begun to oppress beings into vengeance against society. 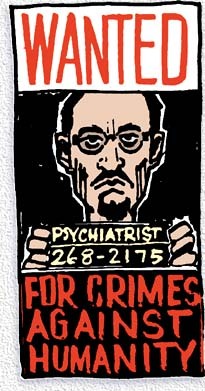 There’s only one remedy for crime—get rid of the psychs! They are causing it! Ah yes, it’s true. Cases and cases of research on criminals. And what’s it all go back to? The psychs! Their brutality and heartlessness is renowned. The data is rolling in. Any more you pick up off a criminal or anyone, send it in. On crime we have an epidemic running on this planet. The wrong causes psychs assign for crime plus their own “treatments” make them a deadly virus. The psychs should not be let to get away with “treatments” which amount to criminal acts, mayhem and murder. They are not above the law. In fact, there are no laws at all which protect them, for what sane society would sanction crimes against its citizens even as “science”? They should be handled like any other criminals. They are at best dramatizing psychotics and dangerous, but more dangerous to society at large than the psychotics they keep in their offices and loony bins because they lie and are treacherous. Why the government funds them I do not know. They are the last ones that should be let loose to handle children.